Troy talks about living with diabetes. 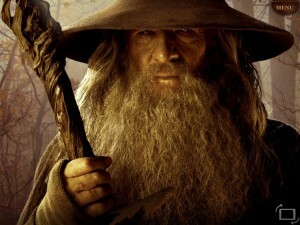 Middle Earth fans ‘ prayers are finally answered in the (belated) film of the popular prequel to Tolkein’s trilogy. I fell in love with the world of Middle Earth aged 9. I would go on to read the books, and for Christmas I then received a copy of – you guessed it – The Hobbit. Unlike the books that followed, it was aimed at younger children…so why hadn’t it been made into a film first, after it was said Lord of the Rings would be ‘unfilmable’? Well, that time has finally arrived. I saw it in IMAX, so the experience was further heightened by deafening surround-sound, and having to turn my head to accommodate all that was happening on an absolutely massive screen. Not that I was complaining…though my neck certainly was! Made in 3D, and in twice the normal frame rate (which I am still unsure about), the Hobbit in question is Bilbo Baggins (Martin Freeman), a tubby little fellow who, like all Hobbits, lives in a hobbit-hole in the lush country of the Shire. He lives a comfortable, but rather dull life, until he is visited by a very familiar-looking wizard named Gandalf (Ian McKellen), who asks Bilbo to join him on an exciting adventure. 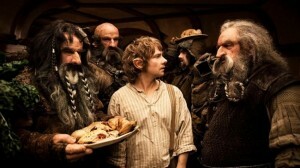 A little puzzled (and more than a little bit daunted), Bilbo politely turns down his invitation, and sends the wizard on his way, believing this will be the last time he sees Gandalf…so imagine his surprise when thirteen, battle-ready dwarves turn up on his doorstep that very same evening, and start eating all his food! Besides Gandalf, their leader is Thorin Oakenshield (Richard Armitage), a Dwarf-Prince who proposes they (and Bilbo) go on a quest to reclaim his grandfather’s kingdom, Erebor. A fearsome dragon by the name of Smaug attacked and invaded their home many years before, taking all the gold for his own, including a large diamond called the Arkenstone, and naturally, Thorin wants it all back. But where does Bilbo comes into this, I hear you ask? Due to his small size and quiet nature, he is ideal for the role as a burglar, and can sneak around unnoticed by whatever foe may come their way – and there are a lot of those, as you would expect! Like all of the Lord of the Rings films, the scenery and the music are suitably EPIC. Yes, the capital letters are necessary, just to convey how truly epic they are, particularly when stretched across a giant screen. There are also some familiar faces along the way, but none more so than Gollum (Andy Serkis), who Bilbo stumbles across in a cave. In a bid to save himself from getting eaten, Mr. Baggins challenges Gollum to a game of riddles. 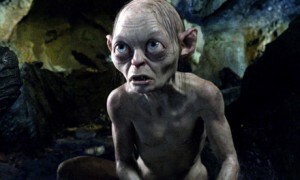 This turns out to be one of Serkis’ finest, most entertaining performances, as Gollum (and Smeagol!) try to outsmart the hobbit, while arguing with himself constantly. Freeman takes to his role as Bilbo like a very British duck to water, and the resemblance between him and Ian Holm (the older Bilbo) was incredibly surprising. As for Ian McKellen, well, it is as if he hasn’t played Gandalf since 2003 at all, and falls into the role once again wonderfully. However, I do still have my doubts about the book being stretched across not just two, but three films. 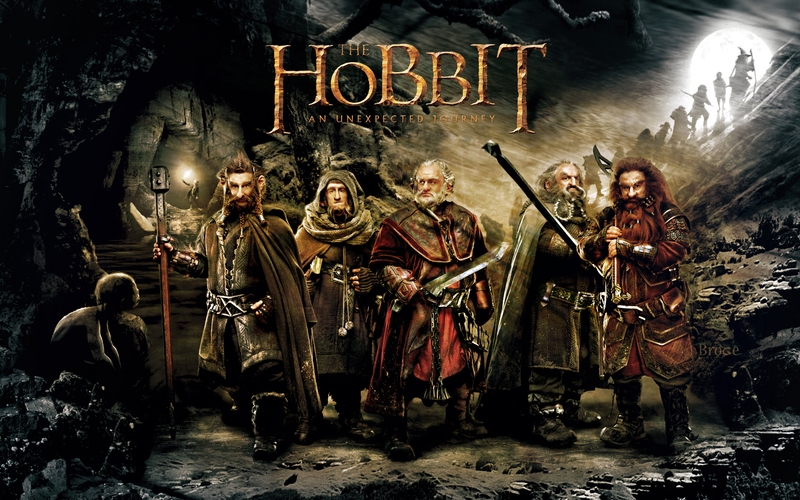 To fill them out, Jackson delved into some of the appendices of the Lord of the Rings book series; the result was that some of the added scenes didn’t seem particularly necessary (though a real hoot to watch), and gave the film a rather bloated feel. My other criticism is the quality of the camera tone. It was a nasty surprise when the film started, as the audience is not used to being able to count every pore on Martin Freeman’s face, and though you get used to it after a while, the blurring is a little distracting. The second part of The Hobbit is called The Desolation of Smaug, and will be on our screens on the 13th December 2013. The final part is There and Back Again, which is out on the 14th July 2014. After a great deal of intense consideration and numerous cans of Red Bull I have finally compiled my top 20 films of 2012. I would, however, like to point out (before ICTV’s resident cameraman Matt throws his hands up in disgust), that over the festive period I have failed to watch two of the biggest movie blockbusters…Peter Jackson’s The Hobbit and Ang Lee’s Life of Pi, therefore I fear that my top 20 may not be completely accurate…I’m especially intrigued to see The Hobbit which was filmed at a revolutionary 48 frames per second, that’s worth a few brownie points alone – yes, sadly this stuff impresses editors like myself. Anyway, enough of the waffle, here is the list in reverse… I enjoyed the top five so much that I have included my own personal reviews. (20) Looper – Dir. Rian Johnson. (14)Once Upon a Time in Anatolia – Dir. Nuri Bilge Ceylan. So… I went to see this film with a group of girls from work (the majority of which are avid Channing Tatum fans… purely for the love of his acting… of course). I hadn’t heard much about it beforehand other than that the plot consisted of the life of a male stripper. Naturally I assumed it would be a load of light entertainment fluff (enjoyable… but definitely fluff). Well, to my surprise this was not the case. The film contains a great deal of depth and an intelligent plot that explores real issues relating to the adult dancing industry and the lifestyle that surrounds it. Matthew McConaughey plays an excellent supporting role as the businessman behind the strip clubs, which is great to see as he is usually cast in soppy chick-flicks. The rest of the cast play their parts convincingly – even Channing who is actually not that bad of an actor. I enjoyed the realism in the film and found the dance sequences highly entertaining (as did most of my friends). This was the biggest surprise of the year, and I thoroughly enjoyed it. I always make it a priority to watch the film that wins the yearly Golden Palm at the Cannes Festival. It was a challenge to convince my boyfriend to watch this with me, he had lost faith after I suggested watching the 2010 Palm winner Uncle Boonmee which revolves around a family dinner party of reincarnated glowing bears and a woman that has relations with a talking Koi Carp! Nevertheless, we both saw Amour and it did not disappoint. This character driven film depicts the life of a happily in love elderly couple. Early on in the film the lead character Anne has a stroke and throughout we slowly witness her health deteriorate. Her husband George lovingly cares for her until her final day. The film does not solely revolve around what is happening to Anne but it concentrates on their relationship and their private ways of dealing with each other. Despite what you might think, I felt quite uplifted by the film and it’s depiction of love between the two characters. 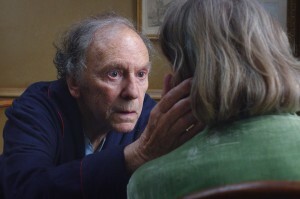 Haneke is a serial Cannes winner who usually explores the more sinister side of human beings (seen especially in The White Ribbon and Hidden), so it was refreshing to see a different side examined. Overall, I believe it was a deserving win and a very touching story without patronising or over-dramatising. Before I start, I must confess that Ken Loach is one of my favourite directors,so I may be slightly biased. The Angel Share throws together a group of Glaswegian misfits who are serving a community service program together. During a sponsored trip to a whisky distillery, we discover that lead character Robbie has a rare and profitable skill for whisky tasting, which expectedly leads to a whisky related escapade. The film is funny, different, thought provoking and is clearly directed by someone who embraces the human spirit and gives people a chance from all walks of life. The film follows the typical Ken Loach conventions of working class social struggles and uses a cast of non-professional actors who fit their roles perfectly. It is lighthearted which is uncommon for Loach but he pulls it off well. Furthermore, I was quite impressed to see this film distributed at Ipswich’s mainstream cinema. An unusual choice for a Loach film, but I’m not complaining. Even the Rain tells the story of a Spanish film crew who arrive in a poor area of Bolivia. They are making a historic film about the arrival of Columbus and the oppression of the indigenous people that soon followed. As the plot unravels, we see uncomfortable parallels between the 500 year old colonial oppression and the relationship between the film crew and the present indigenous people, who have been cast for less than two dollars a day – “…after all”, the director explains whilst sipping on champagne, “we are on a budget…”. It is the screenplay that is the real gem of the film. The dialogue is powerful yet subtle, it does not preach but does pose uncomfortable questions (often home truths) about the effects of globalisation. Its critique on religious imperialism may be controversial to some, but I think the director has made a brave attempt to portray the lasting effects of colonialism in the modern world. The cast is fantastic and stars one of my favorite actors Gael Garcia Bernel and is set against a beautiful backdrop in Bolivia. Overall, a really enjoyable drama. (1)The Dark Knight Rises – Dir. 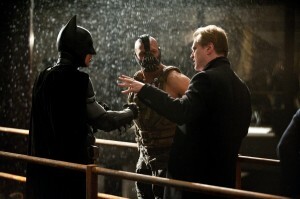 Chris Nolan. Nolan has pulled off another great addition for his batman trilogy. He has managed to make a film which is essentially about a troubled man who dresses up as a bat and has turned it into a gripping film with a plot that explores serious political and social issues that can be seen in our current economic climate. The film not only contains great set pieces and special effects it also contains dark and multi-layered drama. The film contains sentimental undertones and shows the deeper sides of the characters and delves into the reasonings for their often destructive motives (sometimes I found myself agreeing with the villain Bane – the man often talked some sense). The drama did not fail to impress and the casting was perfect. The film not only pleases mainstream cinema goers but the art house crowds love it too. Easily my favourite film of the year!